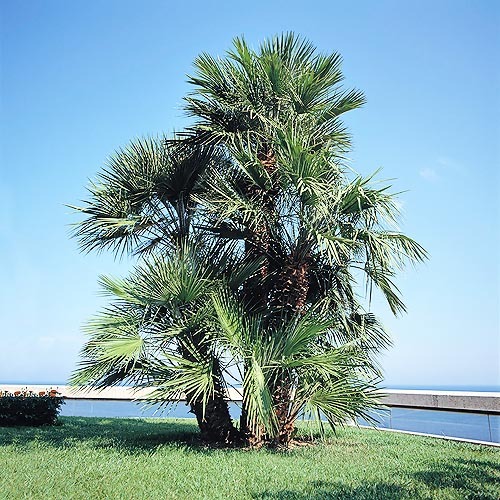 The Chamaerops humilis L. (1753) is native to western Mediterranean, particularly Algeria, Morocco, Tunisia, Libya, Italy (western Sicily and Sardinia), Spain and Portugal. Probably introduced in remote times along the Tyrrhenian coasts of Italy and of the south of France. It grows preferably along the rocky costs or on arid soils, generally calcareous, in full sun, up to 1.000 metres of altitude (in North Africa). The name of the genus comes from the Greek “chamai” = on the ground, and “rhops” = bush; the name of the species comes from the Latin “humilis” = low. Both refer to the appearance of the plant. Known in Italy as palma nana, palma di San Pietro, it is called in Sicily ciafagghiuni, giummarra, scuparina, scupazzu; in Sardinia: margaglio’, pramma, paimmizzu; in Spain: Palma de escobas, Palma de palmitos, Palmera enana; in Portugal: Palmeira ana, Palmeira das vasouras; in France: Chamérops humble, Palmier nain, Palmite nain; in Germany: Zwergpalme and in the English-speaking countries: Dwarf fan palm, and Palm cabbage. It is a species which is extremely variable in appearance, colour and shape of the leaves. Usually, it has a bushy appearance, with stems, of about 15-20 cm of diameter, covered by a brown fibre and by the petioles of the dried up leaves. Stems which generally keep low, but which can reach, under optimal conditions, the 6-8 metres of height. 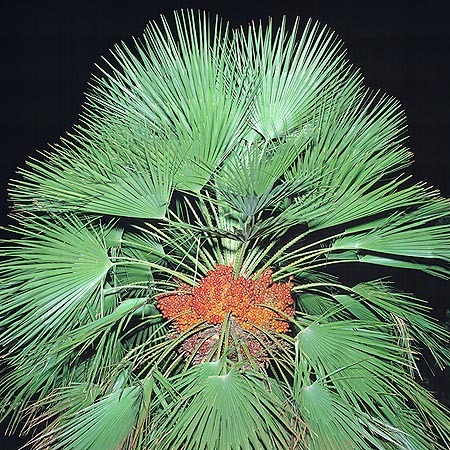 The leaves are palmate, rather rigid, and almost circular, of about 60 cm of diameter, of pale green colour on the upper side, and with a whitish waxy bloom on the lower one, with several forked segments in the apical part. The petioles, long even more than one metre, are equipped with strong thorns along the margins. It is a dioecious plant, but there are specimen, although rare, with hermaphrodite flowers; the short inflorescences, much ramified, carry flowers with a deep yellow colour. The ovoid fruits, 1-2 cm long, have a colour varying from orange to brown. It multiplies by seed, which germinates in about two months, and, with some difficulty, by division. Presently, it is widely utilized with ornamental purposes in the Mediterranean climate countries, either for its look or for its great adaptability to poor and arid soils and for the resistance to low temperatures (up to -12°C). In the past, it had, on the contrary, an important part both in feeding as well as in several handicrafts. In the Roman times, the alimentary usage of the young sprouts was known in some locations of Sicily and North Africa, and until the beginning of the twentieth century, the leaves were utilized in the fabrication of baskets, hats, fans and brooms (from which many common names). Synonyms : Chamaerops arborescens (Pers.) Steud. (1821) ; Chamaerops conduplicata J.Kickx f. (1838); Chamaerops depressa Chabaud (1915); Chamaerops elegans Hook.f. (1884); Chamareops humilis var. dactylocarpa Becc. ex Martelli (1889); Chamaerops humilis var. decipiens Becc. (1920); Chamaerops humilis var. depressa Mart. (1838); Chamaerops humilis var. elata Mart. (1838); Chamareops humilis var. hystrix Becc. (1920); Chamaerops humilis f. inermis Regel ex Becc. (1920); Chamaerops humilis var. lusitanica Becc. (1920); Chamaerops humilis subvar. macrocarpa (Tineo) Nyman, Consp. (1882); Chamaerops humilis var. macrocarpa (Tineo) Nyman, Consp. (1890); Chamaerops humilis f. mitis Maire & Weiller (1957); Chamaerops humilis var. sardoa Becc. (1920); Chamaerops humilis var. sicula Becc. (1920). → To appreciate the biodiversity within the family ARECACEAE and find other species, please click here.